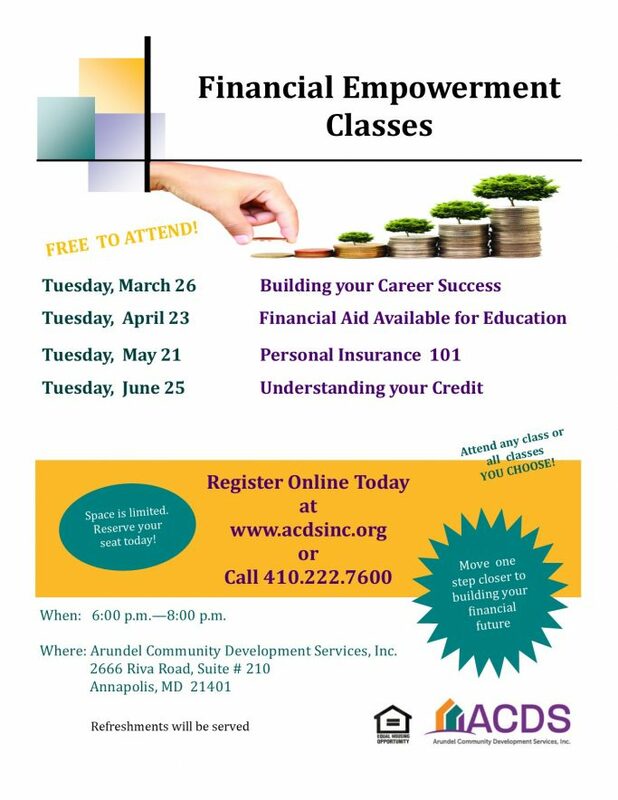 Spring into our Financial Empowerment Classes - Arundel Community Development Services, Inc.
ACDS Financial Empowerment Classes are back in session and we will be hosting classes at our office located in Annapolis, MD. Beginning at the end of March, ACDS will offer our fourth series of FREE workshops to help residents move toward financial stability and success! The series, which will be taught by experts in the field, will include four different evening workshops on important financial topics. Click on the links below to learn more about the workshops and to register. Anne Arundel County residents attending will be eligible for free, one-on-one follow-up financial counseling. The Financial Empowerment Program is made possible by Anne Arundel County, private donors, and the State of Maryland CITC Program.